Treat yourself to free sandwiches and cookies — and don't forget the pizza deals! Tax Day is today, and if you've already filed your Form 1040 — or even if you haven't — you can treat yourself with freebies. Check out all the Tax Day deals you can grab below. Be sure to bookmark this page and check back often, as we'll be updating it with confirmed offers when they come in. We've put an asterisk (*) next to the Tax Day deals we've confirmed so far. A Strawberry Dollarita with Twizzlers candy can help you drown your sorrows after you fork over cash to Uncle Sam. This $1 deal runs all month, too! Click here to find your nearest location. Want restaurant food delivered this Tax Day? Spend at least $20 on your order and the delivery fees will be waived on April 15. To redeem this deal, be sure to use the coupon code "TAXDAY19" when you order online or via the app. Get a half-price large deep dish or tavern-cut pizza today. The offer is valid for dine-in, takeout, or delivery orders. Plus, Tax Day kicks off a free delivery and no-service-fee promotion, which runs until May 5. Once again, you can grab a half chicken individual meal with a drink for only $10.40 via a coupon. This offer ends today. Treat your co-workers or just drown your sorrows in a massive amount of carbs with this deal. Pick up 13 bagels and two tubs of cream cheese for only $10.40 today. Swing by your local California Tortilla today and say "1040" when ordering, and you'll earn free chips and queso with any purchase. This promotion isn't valid with other offers, or online or delivery orders. Diners who downloaded the Capriotti's app on iOS or Android could upsize from a small to a medium-size sub for free on Tax Day 2018. Click here to find your nearest location. In the mood for seafood? Look for Captain D's to bring back its Tax Day offer. Last year, diners could get six pieces of batter-dipped fish, one family side, and six hush puppies for $10.40. Click here to find your nearest location. In 2018, Chuck E. Cheese's made sure you could still afford to treat the whole family, even during tax season. You could stop by a participating location and receive a free large cheese pizza with the purchase of any other large pizza. Click here to find your nearest location. Thanks to a coupon, you can get your fill of pizza for less on Tax Day. 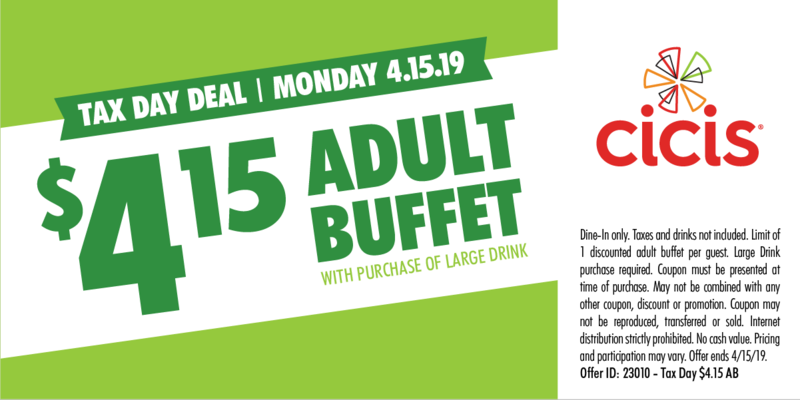 Stop by a participating Cicis location and purchase a large drink to receive an adult buffet for only $4.15. Join the chain's rewards program and then treat yourself to cheap caffeine. DD Perks members can grab a medium hot or iced coffee today for only $1. Score two breakfast burritos or two Double Big Cheeses for $10.40. These deals are available all day, with no limit. See participating locations here. 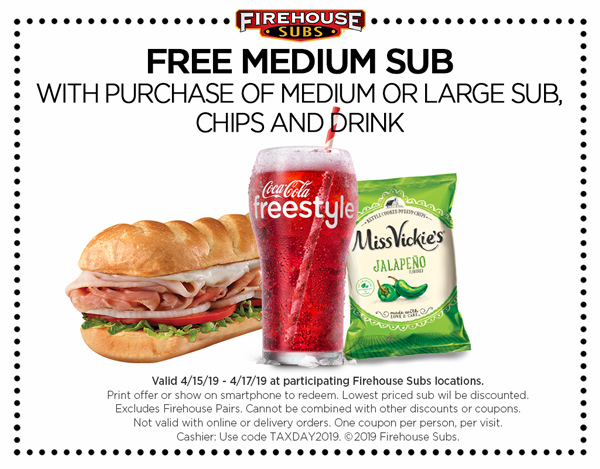 Buy a full-priced medium or large sub, plus chips and a drink, and receive a free medium sub with this coupon. This deal is good through April 17, so no worries if you can't make it today! Once again, the cookie shop comes through with a sweet freebie to take the bitterness out of Tax Day. Stop by a participating store today and pick up a free chocolate chip cookie. Keep an eye out for a cheaper dinner with coal-fired pizza for less. Last year, this pizza place offered a 16" traditional cheese pizza for only $10.40. Treat yourself to a free sausage biscuit on Monday morning — with no purchase necessary! From 7-10 am, you can stop by a participating location and say "made from scratch" to get your breakfast. If you want to treat yourself to free food, pick up your choice of one free original turkey or veggie dog at a participating location. Yet another pizza chain that helped out on Tax Day 2018, Hungry Howie's offered a buy one, get one deal to diners. Customers could order a large 1-topping pizza online, and would receive a medium 1-topping pizza for 15 cents. Watch for this deal — or a similar one — to return in 2019. Participate in National Chill Out Day today, and score a free cup of shaved ice during select hours. Find a participating truck here. Not in the mood for a pizza dinner? Noodles & Company is once again offering $4 off online orders of at least $10. The deal goes through today, and you must be an existing NoodlesREWARDS member to participate. Click here to find your nearest location. Shred up to 5 pounds of documents for free in-store via this coupon. This deal isn't free, but it's still great! Head to the Orbitz Tax Day page today to get started. Once you book your travel, Orbitz will match all taxes on your purchase in Orbucks for use on a future trip. Join Orbitz Rewards, or sign in if you're already a member. Book a hotel or a hotel/flight package. Check your Rewards account after 48 hours. It's not explicitly a Tax Day deal, but you can still score a cheap meal. Get a 2-topping large pizza at Pizza Hut for $5.99 when you order online for carryout. This deal ends today. Visiting a gym on Tax Day might not sound like fun, but what if it means receiving a free massage? This chain of gyms is once again offering a free HydroMassage until April 20, so you don't even have to make time on Tax Day itself. Stop by your local Potbelly today and enjoy BOGO entrees. Buy any one entree and get a second entree for free, today only. Whether you're stressed on Tax Day or not, everyone can appreciate a solid discount. When you dine in at RA Sushi today, you'll get $10.40 off if you spend at least $30. Click here to find your nearest location. Stop in today to get glasses of wine or beer for only $4.15 all day. Find your nearest location here. Stop by a participating location and purchase a medium drink and chips today. In return, you'll receive a free small original sandwich. Click here to find your nearest location. Consumers in Florida, Louisiana, Georgia, Alabama, and Mississippi can shop new kicks tax-free. Today the retailer will cover state sales tax as well as local taxes in-store only. The promotion also applies to accessories, including collegiate apparel, handbags, wallets, T-shirts, and hats. Stop by the chicken tenders chain today and treat yourself to a Chick's Meal for only $5.99. It includes three chicken tenders, fries, Texas toast, and a medium drink. Download the Healthy Rewards app and receive $2 off any smoothie through April 18. IRS has a much nicer meaning when it comes from this barbecue chain. Treat yourself to its Irresistible Ribs Special — take half off a St. Louis rib dinner today only. Last year, the office supply retailer offered a shredding deal similar to the one from Office Depot and OfficeMax. However, Staples only provided free shredding services for up to 1 pound of documents. Still, if you have documents to get rid of, it's a solid deal for Tax Day, so watch for it to return this year. Breathe a sigh of relief that tax season is over and treat yourself to a cheap meal! Stop by a participating location and feast on a $5 burrito from this Tex-Mex chain. If you're feeling particularly proud of yourself, spring for steak for an extra $1. The offer is valid in-store and online, but excludes the Megajuana and specialty burritos. In 2018, you could reward yourself for filing your taxes by heading to Tony Roma's for lunch or dinner. Diners received a coupon for a free Kickin' Shrimp appetizer with the purchase of an entree. Show this coupon when ordering to score a burger and drink for only $10.40 today. This offer excludes the pastrami burger and doesn't include any additional add-ons for a Build Your Own Burger. Spend at least $20 on your order and the delivery fees will be waived on April 15 — same as the Bite Squad offer! Be sure to use the coupon code "TAXDAY19" when you order online or via the app to redeem this deal. Celebrate the end of tax season with a White Castle feast. Take 15% off any order today with this coupon. You'll have to stop in to grab this offer, though — it's not valid for online orders or delivery. 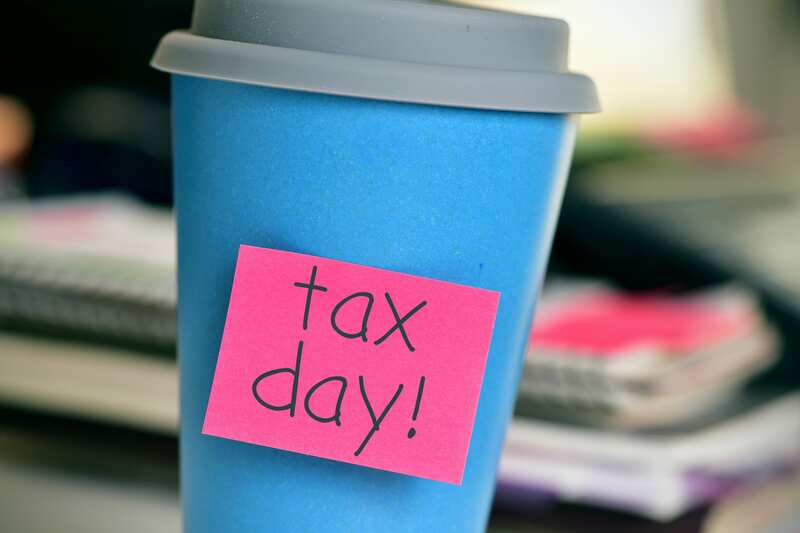 Readers, what Tax Day freebies are you excited about this year? Let us know in the comments below!